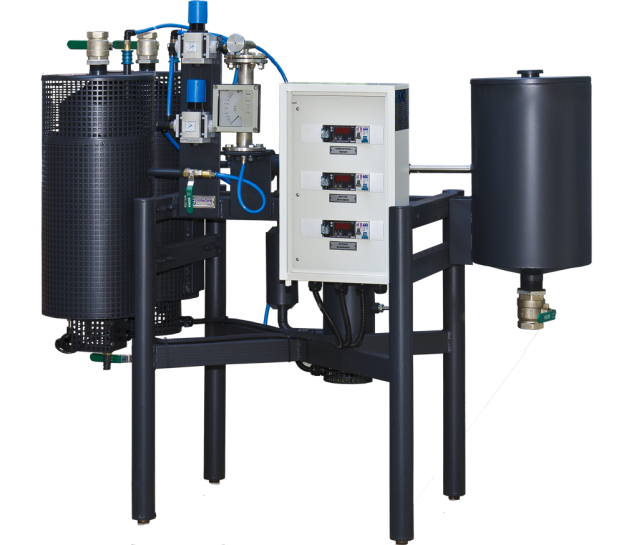 Laboratory Unit for Bitumen Emulsion Production - GlobeCore Bitumen Emulsion. In general, laboratory unit can simulate processes on a small scale, occurring in the real world. This is exactly the type of equipment by the help of which the first bitumen emulsion was obtained in the 20s of the last century. Most of the methods of its production are based on emulsifying bitumen in water, which in the laboratory conditions can be achieved by means of: – paddle stirrer; – ultrasound; – colloid mill; and – combined method. GlobeCore offers to laboratories, research institutes and industrial enterprises, specializing in the production of bituminous materials, the UVB-1L laboratory unit, designed for: – development and testing of bitumen emulsion recipes; – preparation of laboratory samples (lots) of bitumen emulsions. The principle of operation of such equipment is based on chafing bitumen particles in between the rotor and the stator of a colloid mill in a gap of 0.5 mm, and creating at the interface of water and bitumen phases a layer of surface-active substance. The application of a colloid mill makes it possible to obtain a highly stable product, which is not always possible in the case of using conventional paddle mixers (are not able to crush bitumen to the necessary level) and ultrasonic vibrations (require a preliminary fine crushing of bitumen). The advantages of the GlobeCore UVB-1L laboratory unit are: – control of the samples quality with low consumption of the initial materials (bitumen, water, emulsifiers, and others); – testing of any bitumen emulsion recipe; – production of prototype samples of cationic and anionic bitumen emulsions with a maximum capacity up to 20 L/min; – study of the material properties when modifying additives are added; – possibility to supply the unit as separately, as in a bundle with bitumen emulsion plants, designed to produce bitumen emulsions on an industrial scale; – ability to operate in a semi-automatic mode; – this equipment can be especially helpful to producers of bitumen emulsions who develop their own recipes in accordance with the local regulations; – possibility to get consultations of highly-skilled experts as at the stage of selecting equipment, as at the stage of its operation; and – ease of use.